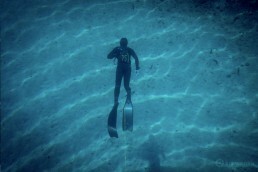 With freediving expert Nik Linder and Seatrekking founder Bernhard Wache. – Breathing, weightlessness, infinite space…. Hiking equipment (weather, temperature May/June) and Freediving / Snorkeling equipment with a warm neoprene suit, hooded (e.g. Cressi Fisterra 5 mm hood and socks). You can find more information under Equipment. All further information on arrival, accommodation and meals will be discussed personally in advance. In addition, each participant needs an insurance policy that he needs to take to camp. We recommend DIVE CARD Basic , it costs 45 EUR and offers 1-year worldwide protection for travel and diving. The trail will only take place when minimum of three people attend. If a participant for good reasons can not participate (illness, force majeure), or the Guide from such a valid reason (Force majeure disease) can not perform the trail, the participant will receive a voucher for another trail to the maximum value of the booked Trail. In case the participant chooses an alternative but not equally priced Trail, the participant himself has to pay the difference. The voucher is valid for three years. Furthermore, subject to the Terms and Conditions the ÁETEM GmbH. Ocean Experience Workshop with Nik Linder and Bernhard Wache.